The decision by Canada Post to end home-delivery, increase postage and eliminate approximately 10,000 jobs is, in our opinion, an egregious assault on public services in Canada. If this plan goes through it will weaken the union movement, put a key federal public service on the path to privatization, and land another neoliberal blow against social solidarity. Since the economic crisis of 2008, Canada has seen an unprecedented assault on workers and public services to pay for the crisis and re-establish the profitability of the banks and the corporations. In the process, the rich are getting richer, public services are no longer being starved of funds but structurally undermined, while private and public sector jobs that provide any chance at a decent living are being squeezed out of existence for the vast majority. Those who are fortunate enough to be in a union are under the gun from federal and provincial government legislation, assaults on pensions and benefits, and devastating plant closures which impoverish entire towns, counties and regions. But all is not lost. We can turn this around. We believe that there is a real possibility to build a movement spanning Canada and Quebec to stop these attacks, and even build the power to make positive transformations to our postal system. There are four key reasons why we don’t think this isn’t just wishful thinking. representation (most members are concentrated in Ottawa), and the transport workers unions which are organizationally fragmented between many unions and companies, CUPW is well situated to engage in a national fight-back campaign. A number of urban CUPW locals still exercise a degree of rank-and-file shopfloor militancy that includes the use of wildcats, slowdowns and work-to-rule. In 2011, the rotating strike/lockout required the union to organize actively its members in a way that they hadn’t done for a decade. 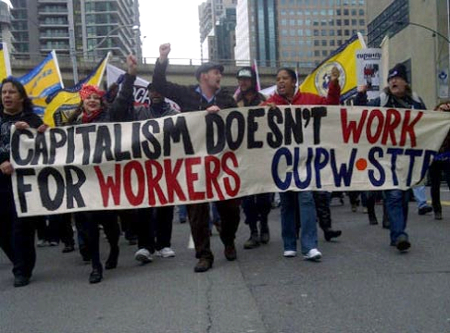 Before that strike/lockout many of the 50,000 CUPW members had never walked a line (when was the last strike/lockout?). The lessons learned in 2011 about state power, duplicitous management, collective solidarity and community outreach were important for the unions’ current ability to build the fighting force and increased militancy needed to counter these changes. Obviously, it is an open question whether CUPW can ratchet up its confidence, militancy and creativity amongst its own members. The conditions are there for them to do so. Those of us who aren’t postal workers should be ready to support the posties in our workplaces and communities. In 2011, activists from across the country independently and sometimes in loose coordination with each other organized a solidarity campaign in support of the postal workers. 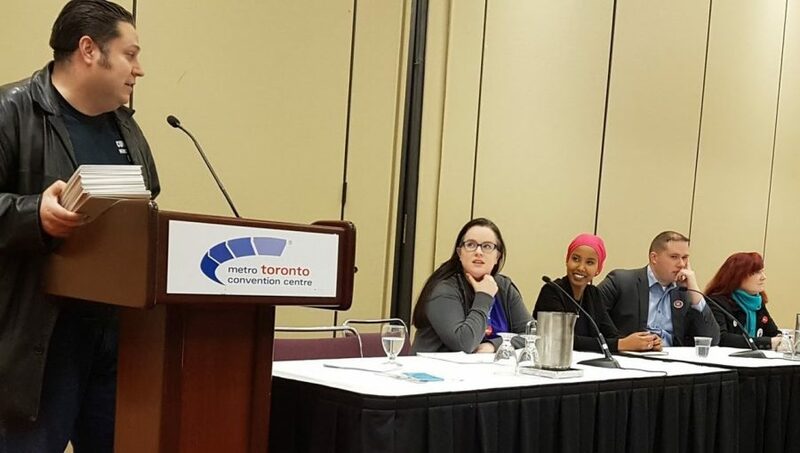 For example, in Halifax activists put on multiple rallies, went door-to-door to thousands of residences, developed an extensive poster campaign, crafted accessible literature and designed a website for other activists across the country to access and use those materials. 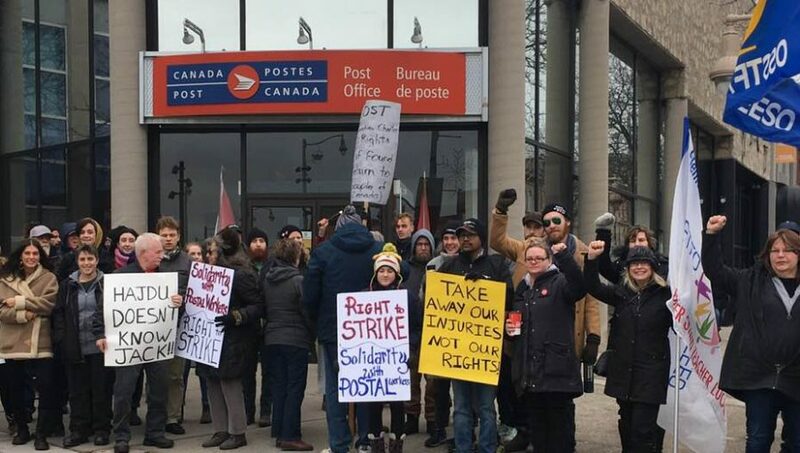 Other similar groups were independently active, such as the People4Posties in Ottawa, which occupied Tory MP riding offices with CUPW members. Meanwhile, campus-based labour unions, student unions in Quebec and English Canada and Students Against Israeli Apartheid joined forces to create Students4Posties. These experiences are not entirely lost, and the social and organizational links created still exist in many places. The infrastructure of solidarity can be revived and initiated where it doesn’t exist. These experiences and networks preceded Occupy, the Quebec student strike and Idle No More. Occupy has placed questions of class power and wealth inequality, democratic control of society, and alternatives to capitalism in the public sphere. The Quebec student strike has challenged us to think about thankless but strategic organizing in a concrete way, while opening up questions about the purpose of public institutions. Idle No More has delegitimized the federal government in fundamental ways and educated many on how to be allies in action, instead of just words. Last but not least, all three movements have pushed municipal, provincial, and federal governments to expose glaringly their anti-democratic interests and reliance on legal and police repression in defence of the status quo and the interests of profit accumulation. In short, we are better situated than in the spring of 2011 to build a national movement around the Canada Post cuts. against the Harper government (and other governments too) on cuts to the social safety net, legislative assaults on labour, and environmental deregulation. dozens of high schools walkout against the government bills and in solidarity with teachers. These walkouts helped disarm a good portion of the media-generated anti-union backlash. independent of their union, a media-generated backlash was noticeably absent. union organizing and dramatic rollback of federal health and safety regulation. some provincial unions, labour councils and locals. Many realize the necessity of a province-wide movement against right-to-work. So far this has not coalesced. the left to engage the public on an issue that literally affects the majority of Canadians. An August 2013 poll commissioned by CUPW found that 69 per cent of Canadians opposed Canada Post privatization. Moreover, 63 per cent support an expansion of Canada Post services, including financial services like postal banking as a public alternative to the banks. attacked. This will put all pensions at further risk, and this should open up room for widening the campaign for the expansion of the CPP. 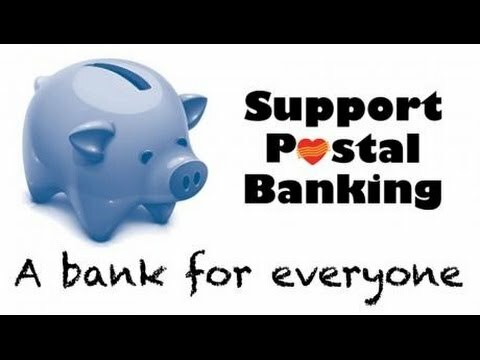 CUPW is advancing postal banking as an alternative source of revenue, and it could play a particularly important role of facilitating the savings and banking services for rural working-class Canadians. It is also possible to imagine postal offices across the country as sites for providing Service Canada (as the post office is often the only federal government building in small towns). favourable light, and people simply don’t like the idea of having to pay more for a crappier service. of small employers (who will be hurt by Canada Post cuts) to anti-union, anti-worker, anti-democratic organizations such as the Canadian Federation of Independent Business (one of the key sources of neoliberal ideology in Canada and support for the Conservative agenda). and often sectarian Left. It also trains the Left as organizers, as individuals and as an organized force, who can then go and train to empower others. Canvassing goes beyond engaging in a conversation, listening to people’s views and grievances, and explaining what’s going on at Canada Post. It allows us to ask people to put a sign in their window, mailbox, or door. It is by no means a radical act. But it is an act of social solidarity and can only be positive for postal workers themselves. right Conservative government of David Cameron in Britain, over two-thirds of people still supported it remaining public. We need to be building a wider organizational capacity to back up any militant steps that CUPW might take with large numbers of people ready to take actions in support. actions and demonstrations. But we need to make sure we can move beyond just inviting people via Facebook or posters. The campaign should be seen as empowering – listening, informing and providing avenues for action need to be built into each aspect of this fightback. Every act should build further possibilities for mobilization and organization. the idea that public services aren’t about profit. Think of it as throwing matches on the ground, who knows what will catch fire? self-evident coalition partners with experience and resources which can also attract more people if they’re engaged openly in a campaign. assets to any popular left-initiated coalition in defence of Canada Post. a nationwide battle to save a public service is a wonderful entry point to start to win people and activists over to working and developing politics together. capitalism can somehow be made just within the given social and power relations in our society. This we believe is an absolute falsehood. The only way to fight for justice, housing, food, etc., for all is to replace capitalism. a reform but also have grown organizational capacities, sharpened our politics and been part of a mass lesson in collective power. If we simply cede this fight to narrow reform campaigns, than we will miss an opportunity to connect radical politics to the most relevant issues of the day for the working classes in a big way. the necessity for strategic campaigns that force the left to organize to its right. if we are strategic and diligent, grow our movements and politics along the way. take effect. The Left itself suffers from this same fatalism. The neoliberal agenda relies on this psychological effect, that the objective conditions make it impossible to fight against the inevitable. This can be overcome, not just with good ideas, but with strategic organizing as well. The longer we wait before actively fighting these changes the greater the risk that the campaign will encounter entrenched pessimism on the issue. This is an opportunity to deepen labour and community ties, grow explicitly leftwing movements, train and deepen the political and strategic skills of activists, connect left wing activists across the country, campaign on an issue that affect millions of Canadians, and deal the right a defeat. 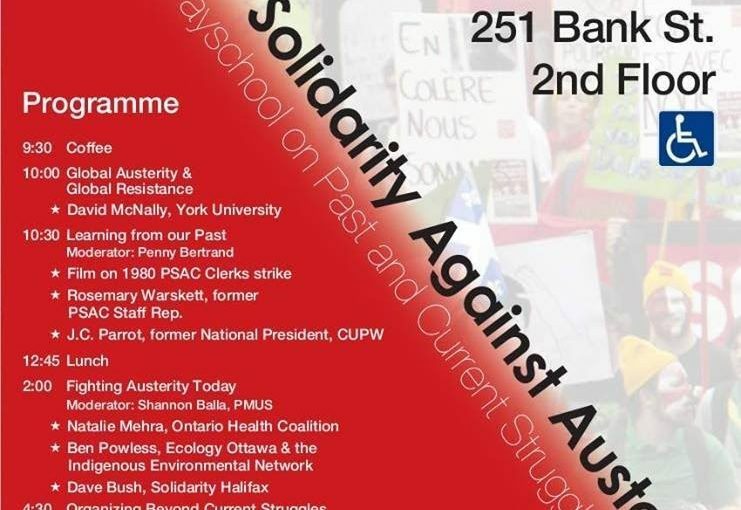 Doug Nesbitt is a labour activist and is a co-editor of RankandFile.ca .